Together with the Indonesian archipelago and the island of Borneo, Malaysia is home to the world's third largest tropical rain forest behind the Amazon and the African wild jungle. As such, Malaysia is blessed with a plethora of natural resources, from minerals, tin, rubber and cocoa to pineapple and palm oil. The furniture industry of Malaysia has become one of the country's most vibrant sources of growth. From its humble beginnings almost 15 years ago, this cottage industry evolved from a timber and logs based sector to become a major exporter of plywood, sawn timber, and wood panels. Today, furniture accounts for about 30 to 40% of the sector's earnings compared to just over 2% back in the 1980's, making it the star performer of the timber-based product sector. Having excelled in the processing of timber products, on the upstream side first, Malaysia quickly became a large exporter to over 160 countries. Of the furniture exporting countries, Malaysia is the 10th largest worldwide. The overall volume of exports last year was valued at approximately 1.5 billion dollars (US). When the Malaysian government implemented its first Industrial Master Plan (IMP) (1986 to 1995), the furniture industry was identified and included as one of the top priority industries and a number of incentives were designed to further enhance its growth and development. Now working under its second IMP (1996 to 2005), Malaysia and the furniture industry is growing extraordinarily fast. Even during the 1997 Asian economic crisis followed by the 1999 global economic downturn, it grew at the rate of 8 to 10% annually. The Malaysian furniture industry has acquired tremendous experience and is recognized for its consistency and punctuality as a supplier of quality furniture. At the same time, the government has maintained its support for the industry through the creation of different institutions such as the Malaysian Furniture Industry Council and the Malaysian Furniture Promotion Council. Recent global furniture production has increased by less than 2% annually, but the trading rate of furniture items is much higher, having increased by more than 8%. “Malaysian exports are worth USD 1.5 billion while the total world trade figure in furniture is almost USD 60 billion. Malaysia is only 2.5% of this figure, so there is still a lot room for growth”, asserts Mr. Tan Chin Huat, Executive Advisor of the Malaysian Furniture Industry Council, who is also in charge of the annual organization of the Malaysian International Furniture Fair (MIFF) that will take place in March 2005 in Kuala Lumpur. Several hundred buyers from the US are expected to attend this important show. The goal is now to increase the volume of manufacturing and exports. The dependence on timber resources has lessened as the industry has adopted advanced design and raw material utilization technologies. Back in the very early days, the industry was 100% based on rubber wood. Today, additional species and materials such as metal, plastic, aluminum and rattan are used. The industry offers a wide range of items, from home furniture to office furniture and upholstery. Nevertheless, the Malaysian furniture industry must now enter a new phase in its development. The need for Malaysia to create its own furniture design culture and to protect intellectual property rights is a top priority, while recreating the manufacturing world through the sourcing of know-how, training methods and new materials. This is the only way the industry will thrive, in a competitive environment that includes emerging neighboring competitor nations such as Indonesia, Vietnam, the Philippines and particularly China. For many years, Malaysia mainly focused on producing as an OEM, and the industry was perceived as a low-end market producer. The Malaysian Promotion Council was established in order to promote the overall industry internally and externally. Paul Wang, Chief Operating Officer of the council, highlights that, “it's not about coming up with a design that has elements of the Malaysian culture that we hope to sell all over the world. It's about being able to create different designs that will fit numerous markets around the world. The key word as such, is not “Malaysia's Design” but more appropriately it should be “Malaysian Designed”. The next goal is to upgrade the entire industry into the medium and higher-end market segments. With more energy allocated to design and quality control procedures, the Malaysian furniture industry will succeed in creating its own niche markets and be identified as an icon in the eyes of worldwide furniture players. “We need to get into the mind of retailers, wholesalers, importers, manufacturers and also into the contract manufacturing and furnishing sector first. It is only through these people that we will be able to reach the rest of the market. The aim is to sell tomorrow's furniture, at tomorrow's prices into tomorrow's markets. Tomorrow's furniture means Malaysia's own design for which we can dictate the price, and tomorrow's markets means we decide to whom we are selling,” explains Paul Wang. The US remains Malaysia's most important trading partner in furniture with a total value of about 336 million USD in 2003. However while the US has been the country's largest export market for the last decade, the total figure has only increased by 2% over the last couple of years. The government would like to further consolidate this position notably through the encouragement of more strategic partnerships, not necessarily under the form of investment or transfer of funds, but rather in terms of exchange of know-how and expertise. “The government and the private sector should encourage more foreign investment and the creation of more joint ventures, not confined to manufacturing only but also for marketing, strategic or supply source oriented activities,” insists Mr. Tan Chin Huat of MFIC. US buyers have diversified their sourcing, visiting other nations. The next step is now for Malaysian furniture makers to work towards getting their products better marketed and distributed. One of the organizers, MFPC, was created in September 2003 and was established by the government in recognition of the huge potential and substantial contribution of the furniture industry to the economy's foreign exchange earnings. The MFPC has a two-pronged strategy; namely, design enhancement and market enhancement. This spring will see the commencement of the furniture design services program - a pioneering project that entails contracting a group of furniture designers, freshly graduated and practicing, to work hand in hand with key Malaysian furniture manufacturers. They will develop a Malaysian brand of aesthetics, practicality and value. “MFPC is carving out paths to tackle various design and market related issues such as R&D, education and training, Intellectual Property Rights (IPR), branding, marketing strategies, integrated marketing communications and image enhancement,” says MFPC Chief Operating Officer Mr. Paul Wang. Traditionally, Malaysia has been a location of choice for furniture OEMs. But the country is now moving towards original design manufacturing (ODM). A few companies have taken the risk of adopting radical changes in their business plans by upgrading their production to higher value-added furniture incorporating indigenous design and better finishing. The country is also showcasing home grown brands, some of which have already chalked up export success, such as Kian Furniture. First established in 1983 as a wholesaler of chairs and tables, it now exports high quality tables and chairs to 89 countries. The company opened Malaysia's first lifestyle furniture stores, Homelife, which now offer global lifestyle furniture with Asian traditions in manufacturing tropical, ethnic, contemporary oriental and colonial inspired furniture. With 5 factories covering Malaysia, China, Indonesia and soon Vietnam, Kian's General Manager, James Ng, aims to create a network of 50 outlets worldwide with its branding and concept of Asian heritage. “Matching the right OEM with the right partner can create a very profitable and healthy business relationship”, explains Mr. Tan Chin Huat of MFIC. Pohmay, Malaysia's largest rattan furniture manufacturer based its strategy on three elements: specialization into rattan and hardwood products, constant investment in production capacity and high dedication to R&D. The company has successfully penetrated the American market, being the exclusive supplier of home furnishing accessories 100% made in rattan to Pier 1 Import. Pohmay also produces casual living, transitional and contemporary furniture geared to middle class suburban young executives. Delivering high quality furniture by combining the finest traditions of craftsmanship with modern technologies is the corporate philosophy at Hume Furniture Industries. The company produces dining tables and dining chairs in pinewood, oak wood and cherry timber. 100% of its production is exported, of which over 60% goes to the American market where it has formed strategic partnerships with Pottery Barn and the Bombay Collection. “What has surely made Hume unique and successful is its ability to make OEM furniture of high standards”, stresses Hume Furniture Industries General Manager Mr. Law. Best Store first opened in 1999 as a tube and steel bed manufacturer. In 2000, production shifted to sofa beds using tubes, and in 2001 to leather and composite sofas. With 25 staff currently dedicated to design, R&D and sample making, Best Store offers a combination of Italian design and Japanese technology with the competitiveness of being made in Malaysia. All these companies have different approaches with respect to design. Some have in-house designers and others outsource designs from overseas, but they all travel and study market trends and emphasize design and creativity in their development plans. “Setting up your own brand name is not an easy task”, admits Mr. Tan Chin Huat of MFIC. “The brand name is one target; its long process of gaining recognition is another, going Own Design Made or Own Brand Made is more difficult and the returns are uncertain”, he added. This will inevitably be a long process, but surely Malaysian furniture makers have clearly understood the necessity to adapt themselves to the constant variations and changes of market and consumer trends. Today Malaysian furniture makers have embarked on exploring opportunities in developing special furniture projects on the base of customized furniture while slowly implementing their specific design culture. Most manufacturing plants are certified to ISO9002 standards, ensuring the worldwide acceptability of local wood products. The industry is also moving to adopt ISO14000 standards. Over the last few years, China has enjoyed one of the world's fastest rates of GDP growth, reaching an average 8 to 9% annually. When China became a member of the World Trade Organization (WTO) in December 2002, the overall Asian economic landscape changed. Apart from the other Asian giant, India, what country in the world can ultimately compete with the synergies and trade generated by over 1 billion inhabitants? With sales of over USD 5 billion, China is the second largest furniture exporting country in the world behind Italy. In comparison, how can a small nation like Malaysia still compete with China, where the cost of land is low and labor is cheap for such a labor intensive industry like furniture? Mr. Tan Chin Huat of MFIC sees China in the context of healthy competition; “I personally don't see China as a threat, but rather as a challenge, you can turn it into a complimentary relationship. Actually today China is complimentary to us,” he says. Taiwanese furniture businessmen made the first move and have invested heavily in China and many newly established furniture factories are joint ventures with foreigners. For sourcing, international buyers from the US, Germany, UK or France generally follow trends, so many factories have chosen to relocate operations in China. Rubelli is the best illustration of how joint ventures in China can open up new horizons. First established in Malaysia in 1995 as a recliner armchair producer that slowly evolved into upholstery and sofa making, today the company exports 100% of its sofas to Western Europe, Australia and North America. With 5 plants running at full capacity in Malaysia, the company has invested in a brand-new plant near Shanghai. “Looking at expanding our production capacity will contribute to bring our overall operating costs down further and therefore increase our competitiveness. And this will undoubtedly be a very good platform to penetrate the US market”, said Rubelli's Executive Director, Stephen Wong. Another company, Versalink, adopted its own approach and strategy to China. The company established a joint venture there in 2002. “A new brand name was created for the occasion “Frezen”, whose production is solely made to cater to the needs of the mainland Chinese market”, explains Versalink Executive Director, Miss Arica Low. She assessed that Malaysia is facing tough competition from China, so in order to expand business, she says, “we also focus on our management and production process, trying to find ways to bring cost down and make our production line more efficient by minimizing waste and maximizing resources.” For reaching the US market where she would like to develop licensed manufacturing, she places more hope in the new factory Versalink will open this year in Malaysia. Malaysia truly retains many competitive advantages over China even though labor shortages have become a crucial issue and the country needs to bring in large numbers of Indonesian workers. The country offers state-of-the-art transport infrastructure and a relatively low cost of logistics at the heart of one of the world's fastest growing regions, South East Asia. Malaysia has the advantage of the availability of natural resources and raw materials and the majority of the business community is English literate. The future of Malaysia versus China is probably linked to its ability to move furniture production up into higher-end market segments and incorporate cutting edge design. In the past, Malaysia managed to compete with nations like Japan and Taiwan by taking away their low-end market positioning. China is now doing the same towards Malaysia. Efforts at upgrading Malaysian industry are helping the country to tackle new markets. China has turned out to be extremely competitive in the production of metal furniture and this has affected Malaysian metal furniture factories. A perfect example that shows how superior design and R&D can overcome fierce competition is Tube Home, whose founder and Chairman Mr. Y.C. Tan affirmed that one “should not be impressed with China's intrusion in the market”. First established in 1976 and still run like a typical Italian family business, Tube Home has become the leading metal furniture manufacturer in Malaysia exporting a wide range of home furniture to 135 countries around the world. Tube Home first started producing timber and metal furniture. The management gradually implemented a strategy of diversifying its product range with new materials such as plastic and aluminum. “What makes Tube Home still able to maintain its positioning is surely its capacity to make furniture combining all these different materials” highlights Mr. Y.C Tan. Malaysia has witnessed the formation of a large number of factories specializing in office furniture. The majority of them, those with the highest production capacities that cater to the needs of importers like Wal-Mart and Kmart, are based in the Johor Province next to Singapore. The more specialized product-making platforms where office furniture factories like Eurochairs, Versalink and Bristol are located, are in the Kuala Lumpur area. “Office furniture is a much more specific product, it is about providing solutions and services rather than just a product”, explains Eurochairs Executive Director, Mr. Garry Teh, “the design is crucial in the process of creating and adding constant value”. 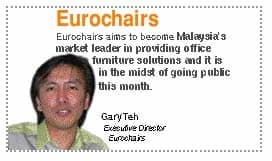 Eurochairs aims to become Malaysia's market leader in providing office furniture solutions and it is in the midst of going public this month. “Quality comes from several factors; management, human resources as well as technology. You need to combine all these elements to reach high standards in quality. We believe we have the right management as well as human resources. Technology is where we need to increase our engagement. Going public will help us raise more capital to invest in upgrading our technologies, increasing our value and therefore reaching our goal of becoming a market leader in this part of the world”, adds Garry Teh. Eurochairs has identified the geographical proximity of Malaysia with other Asean countries as a great opportunity. Its products, designs and branding have been well accepted all over the region. Bristol is another company that felt it couldn't neglect the development prospects the region offers. The company has become one of Malaysia's leading office furniture manufacturers in providing total office furniture solutions as a one-stop service place. Its products are synonymous with quality and innovative design. Bristol has successfully supplied office solutions for large-scale projects and internationally recognized brands’ offices such as British Airways, Motorola, Hewlett Packard & HSBC. Versalink has a strong market position in the production of paneled furniture made of veneer, melamine particleboard, high-pressure laminates, membrane press, etc. The company has developed an impressive client base nationwide and worldwide, from banks, tertiary institutions, universities, logistic & transportation companies to projects for private limited companies. The company exports to Africa, Northern Europe, Russia, the Middle East, the Indian sub-continent and the Pacific region. 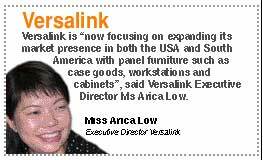 It is “now focusing on expanding its market presence in both the USA and South America with panel furniture such as case goods, workstations and cabinets”, said Versalink Executive Director Ms Arica Low. Malaysia has acquired significant experience and a long tradition as a manufacturing centre; branding and marketing remain the country's weaknesses. “With time, things will change”, believes Garry Teh. Branding is an objective for many companies. The Malaysian furniture industry players still need to learn and “Americans are the gurus of marketing, they can surely contribute to help us in creating our own concepts”, admits Garry Teh. Price competition is the strategy currently in place in most specialized Malaysian upholstered furniture factories. Companies have to distinguish themselves from what is being made elsewhere. This is precisely the path Best Store has embarked on since its establishment in 1999. 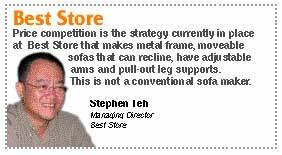 “Since 2000, the company has introduced new items every year, over 100 different models in total”, said Best Store Managing Director, Mr. Stephen Teh, who further explained that the company decided to give their sofas several functions. Using a metal frame for a sofa rather than a wooden frame allows the company to make moveable sofas that can recline, with adjustable arms and pull-out leg supports. This is not a conventional sofa maker. With regard to accessing the US market, Best Store plans to work with agents, which will be faster and easier given the size of this market. On the other hand, Rubelli, founded in 1995, has a different marketing policy. It finds it more effective to visit one hundred retail outlets than to just visit a trade show. “You cannot get all the ideas from just attending a trade fair. It's not necessarily representative of the entire industry. What you see at a show is not always what sells. Whereas what you see in a retail outlet normally sells”, said Rubelli Executive Director Stephen Wong. The company presently sells to importers and distributors in the US, but aims to go directly to the largest retailers. Rubelli provides eclectic design, and this has significantly contributed to its successful positioning in countries like the UK, Australia and New Zealand. They are looking at forms, ideas and models all over the world. Rubelli comes up with their own designs that are in line with the requirements of the markets they target, taking inspiration from what is trendy. Retailers looking to offer their customers a solution that prevents mattresses from slipping around on the bed frames should seriously consider visiting expressAsia's webpage and have a look at one of their latest innovations: unique wooden slats with non-slip rubberized printed surface. This product is already successfully distributed in Europe with Silentnight Beds, UK's largest manufacturer of branded beds for the home. No doubt this new concept will bring new commercial successes and happily complement expressAsia's existing range of innovations that already includes the Universal Bed Frame, a unique bed support system that is adjustable to fit all sizes and types of beds. “This solution enables the retailer to carry much less inventory and yet be able to cater to all the different sizes”, explains Kenneth Kolb, expressAsia's Chief Executive Officer. Innovation is at the heart of his strategy to remain competitive, “I am a strong believer in innovation”, he adds, “in Malaysia, raw material is cheap, so the difference comes from better efficiency,” he says, and concludes, “we cannot compete head-to-head in terms of price with Vietnam for example, so we need to compete by using our heads”. He mentions the new compressing processes developed by expressAsia which allows up to four times the number of pieces of innerspring or latex mattresses to be shipped in a container, and points to WEBS, a business-to-business e-commerce platform developed by expressAsia, that provides a turn-key international supply chain management solution. Kolb has ambitions to take expressAsia on the Kuala Lumpur Stock Exchange: “we are getting ready to go public and are explaining our philosophy to the stock exchange”, he says and adds “this will allow us to raise money and invest into upgrading ourselves”. In light of the recent tsunami tragedy that has befallen a number of countries in South Asia, it is noted that the furniture industry of Malaysia escaped unscathed. So far, damages to the country have been confined to coastal areas of the island state of Penang, Kedah and Perlis that are closer to the Phuket Island of Thailand and the northern tip of Sumatra. There are no reports of any furniture manufacturing factories and related concerns being affected by the incident as there are no set-ups in the areas hit by the tidal waves. As Malaysia is out of the natural catastrophes zone, the recent tragedy affecting a small part of the coastal areas in the northern states is a consequence of spill-over effects. We would like to thank the whole world for their concern over the unfortunate incident. The Malaysian International Furniture Fair (MIFF) 2005 scheduled on March 1-5, 2005 will be held at the Putra World Trade Centre, Kuala Lumpur. The fair has been expanded in size again this year, and all available exhibition space will be leased by 400 exhibitors from 13 countries worldwide. The number of re-registered visitors is up this year and show management expects that MIFF 2005 will be an excellent show. This sponsored supplement was produced by Focus Limited that takes sole responsibility for its content. Text and research by Christophe Bonami. Advertising and Project Coordination by Mary Carmen Luna. For more information please contact info@FocusLimited.net.